Daphne finds Charles Durham dead. She accidentally gets some blood on her skirt. Charles's girlfriend reports Daphne to the police for Charles's murder. At Sarah's party, Lucy notices there's blood on Daphne's dress. 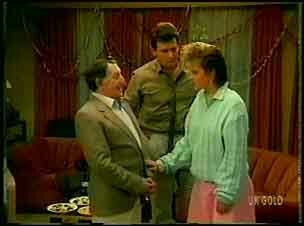 Paul tells Terry that their marriage is over. He goes to call the police. Jim comes in to No.30 and finds Paul on the floor. He's been shot. Jim bends over Paul and Paul tells him with difficulty that Terry did this. Jim quickly calls for an ambulance. Then he gets a cloth and puts it over Paul's wound to try to stem the bleeding. Paul is very distressed and tells Jim with difficulty that everything was a lie - even the baby. PAUL: I loved her, Dad. PAUL: Tell Daphne I'm sorry. Daphne is sitting waiting on a bench when Des turns up. She's so pleased to see him and hugs him tightly. Des tells her not to worry - Harry is organising a solicitor for her. DAPHNE: Des? You do believe me don't you? I didn't kill Charles. DES: Of course you didn't. Daphne doesn't understand why Terry lied. She tells Des about Charles being Terry's ex and the tape - but Daphne doesn't know what was on it. DAPHNE: I didn't kill him, Des. DES: I know. And no-one's going to convince me otherwise. Max is taking Helen to the hospital. Lucy comes out (she was asleep) and Danny and Scott try to calm her down. Danny tells her that Paul has had a bit of an accident, but he won't die. Lucy is upset that she told Terry where the gun was. SCOTT: It's not your fault. Des tells Daphne he's not going home until she can come with him. Daphne starts to cry and says that might be never. DAPHNE: Des, I'm really frightened. Terry was very convincing, wasn't she? Des and Daphne are about to have a moment when Shane turns up. Daphne hugs him. SHANE: Thanks for looking after her till I got here mate. He rolls his eyes quietly to himself. 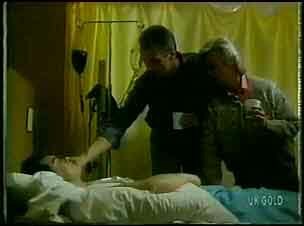 Paul wakes up in hospital with Jim and Helen bending over him. He doesn't want to talk to the police - he says he has nothing to say. Jim sits down with Paul. JIM: I know how you feel, Paul. Paul doesn't want to talk about what's happened - he wants to forget about it. Jim says that maybe in time he will, but for now there's Daphne to consider. He tells Paul not to protect Terry. PAUL: No matter how hard she tried, she couldn't settle down with me - or anyone. There's something in her that nobody can satisfy. She just craved excitement, that's why she married Gordon Mellor. Then she got bored. JIM: So she moved on to Charles Durham? PAUL: Yeah, he was more her style. He had fast cars and lots of money. And he was the front man for some bloke called Robert. Paul explains that Terry made a tape of Charles, boasting about the criminal things he'd done. Terry thought that as long as she had the tape she couldn't be touched. But Durham kept on threatening her and in the end shooting him was the only way out. JIM: Why didn't she go to the police? PAUL:(tearfully) Because she was scared of losing me. JIM: She must have loved you a lot, mate. PAUL: She couldn't care less. I wasn't good enough for her, either. Would you go now, Dad. JIM: I'd like to stay, mate. PAUL: I don't want you here. I don't want anyone here. Max tells Helen that on the strength of Paul's testimony, the police can let Daphne go. Jim comes up. JIM: Oh, his shoulder will mend, alright. Not too sure about the rest of him. Daphne has arrived home with Des and Harry. Des sits her down on the sofa for a cup of tea. Daphne decides to go off for a shower - she is still very upset. Danny, Scott and Lucy are all asleep on the sofa when the adults come back. Jim carries Lucy off to bed while Max takes Danny home. Helen tells Scott that Paul isn't up to visitors - he's very depressed. SCOTT: I tried to let him know what was happening! JIM: What did you say? SCOTT: I thought she was having an affair with Shane. JIM: And what else has been going on that I don't know about?! Jim says he doesn't like things happening to the family that he doesn't know about. MAX: I really liked that girl, you know. Max is upset about what's happened. Shane thinks that Terry was so tangled up in things, she couldn't see any other way out. Shane says that the police have put out an APB on Terry. (All-Points Bulletin). Harry is making fresh-squeezed orange juice for them all. Daphne comes out in her dressing-gown and Shane comes round as well. SHANE: [Last night] made me realise one thing. How much you mean to me. I love you, Daphne. SHANE: I guess I always have. It just took something like this to shake me up and make me think. He kisses her. Des glowers quietly to himself in the kitchen. Daphne, however, doesn't look very sure about anything. 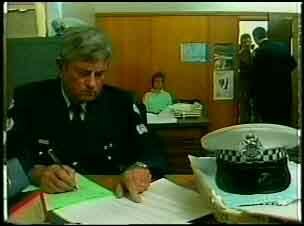 DES: I'm going to take a couple of days off work to keep an eye on her. DAPHNE:(touched) Oh, Des, you don't have to do that! DES:(grumpily) Yeah, I know, but I wanna. Daphne heads over to the Robinsons to tell Helen something. HARRY: After breakfast, how about helping me pack my bags? HARRY: Now don't be hasty, my lad! I might be able to do a favour for you one day! The kids go off to school, leaving Jim and Helen to discuss their financial situation after the Douglas crisis. HELEN: I must have had 'lonely old fool' written over me from one end to the other. Jim says he has more bad news - when he organised a loan for the firm for bridging finance, he had to give Ross some security. He put up the house. Terry isn't in the newspaper this morning. DANNY: I always knew there was something strange about Terry. MAX: Now, listen, she's a good kid! I know what she did was wrong. But I like her, and she's a good worker, too! DANNY: Keep your shirt on, Dad! Shane comes in whistling and tells them that he and Daphne are back together again. Max says he's given up trying to keep up with Shane and Daphne. 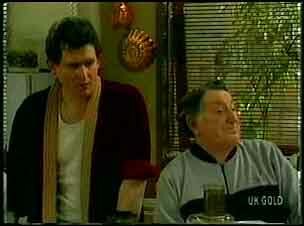 Shane tells them that his work has offered him his own self-contained flat, and he wants to move in to it with Daphne. Danny is not pleased - he can barely pay even his third of the house's expenses! 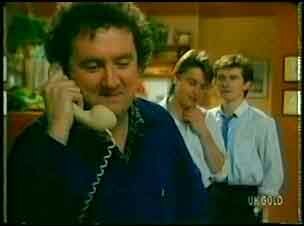 Just then the phone rings and Shane answer it. 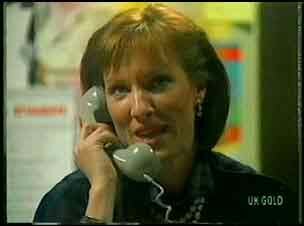 It's Kate the French teacher calling for Max. She invites him out for a date tonight and Max agrees to meet her at the Coffee Shop about seven. Shane and Danny lurk in the background, giggling! Helen is telling Daphne about the situation with the finances and the house. The police can't help and Helen can't repay the money. Daphne says maybe Helen could sell her paintings. HELEN: My paintings are worthless, Daphne. DAPHNE: Maybe not. I didn't tell you, but when I spoke to that woman at the gallery, she said that there was a market for your work. HELEN: Oh. Maybe that was part of the conspiracy as well. DAPHNE: No, they were being honest, really. Can't do any harm to call them. HELEN: Oh, I couldn't, not after what Douglas has done. I couldn't look her in the eye. DAPHNE: You don't have to. Just speak to them on the phone. Harry is writing a letter. He leaves it on the mantlepiece. Daphne comes in and Harry explains that he's off - he can't take all the drama of urban living. He asks Daphne to look after the Coffee Shop while he's gone. He picks up the letter and gives it to Daphne. HARRY: Something you've always wanted, so I thought I'd give it to you. You mustn't open it until you need to, OK? Harry taxi arrives and they kiss goodbye. HARRY: And don't forget...if you need my advice - the letter. Paul is lying in bed looking gutted when Jim comes in. He says he has more bad news for Paul. JIM: Terry's been arrested. Charged with murder. PAUL: What did you think I'd do. Fall apart? PAUL: Dad, do you know something? I don't give a damn.